In this fun and friendly Group let’s share what we see and love in art, if or how it moves us, and discuss if it is important and relevant. We will pick some themes and share our knowledge and experiences. 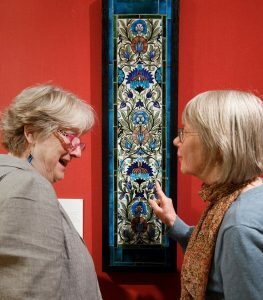 Here members of the Group admire one of the superb ceramics by Victorian artist William de Morgan at the Guildhall Art Gallery on a recent visit. ◻︎ When : Fourth Wednesday, 11 a.m. – 12.30 p.m.
To join the group please complete the contact form below. This form may also be used to contact the Convener on any other matter relating to the Group’s activities.